While cleaning and reorganizing my sewing room recently I found things I didn't remember. I don't know what that says about the condition of my sewing room or the state of my memory! Aprons are making a come-back and are becoming popular again, especially vintage and vintage-style aprons. While surfing several blogs I have seen some wonderful old aprons and reproductions. Here is one exciting find in my sewing room. This pattern was free - "Compliments of Penney's". I love the advertisement on the back. 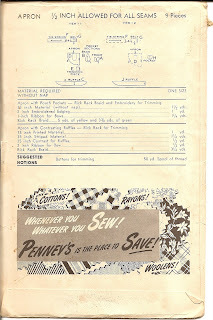 I don't remember fabric at the Penney's stores where I shopped, do you? Maybe someday I'll make these aprons; if I do, I'll be sure and share them with you. While I like these aprons, and this wonderful pattern, there is an apron "pattern" that I treasure far more - my great-grandmother's apron. Nanny always wore aprons at home and most of my memories of her include an apron. After she was gone my grandmother gave me one of Nanny's aprons and I loved it. When I was first married I wore it often until it began to fall apart. Because it was Nanny's apron, and because it was so comfortable and practical, I saved the tattered treasure and carefully took it apart. It became a pattern for more wonderful "Nanny" aprons. 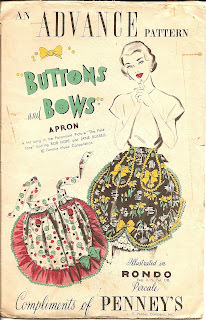 I planned to make aprons from this pattern but I never did. I carefully placed the pieces in a little bag and it has moved from town-to-town, house-to-house with us through the years. Now I have fabric similar to the original apron and I hope to make one very soon. When it's finished you will be among the first to see it. The following poem describes Nanny's apron perfectly. It's almost as if it was written for her. Edited on September 16, 2007 to add: When I originally wrote this post I did not know who wrote the poem I included. I loved the poem the way I posted it - it fit my great grandmother perfectly just the way it was. However, I have since learned that Tina Trivett wrote this poem in honor of her own dear grandmother. It was subsequently altered and changed and published on many websites. Tina recently found my blog and after reading a version of her poem here she left a comment to tell me that she was the original poet and to encourage me to check it out and possibly include the original version. After checking out her story I was moved by the fact that the words of the poem she wrote for a much-loved grandmother had been changed by others and that credit was not being given where it was due. I strongly believe that a poet, an author, an artist, a composer should be honored for the talent and inspiration they give to others. With that in mind I have changed the poem on this post in the spirit of honor and thanks to Tina for putting into words what I wish I could have written in memory of my great grandmother's ever-present apron. Thank you, Tina - and thank you for letting us know of your work. 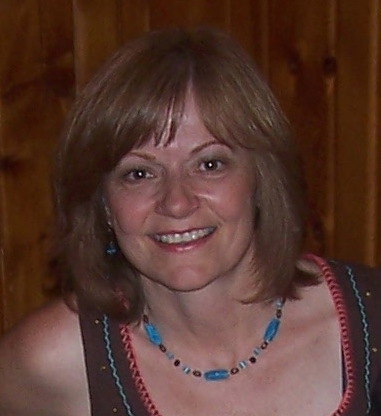 You can find more of Tina's poetry on her poetry blog. Oh my gosh! What are the chances! That we BOTH posted about the same darling apron pattern!!! DO we not LOVE this pattern that was named after a hit song! So excited to have found your blog! I will be sure to go back and read your past posts and get to know you even better! My grandmother always wore an apron too, sometimes an "old" apron over a newer, clean one so if company came over she could remove the old one and be fresh! When grandma died one of the few things I asked for was one of her feedsack aprons. She made them all herself. I have it still and it will always be a symbol of her to me. Hi. I just found your blog. It's very lovely. I noticed that the poem you have up about aprons, is an altered version of my own. You can look at my poetry blog for the real version. I hope you can ammend it. Thanks. Hi,I Just read the poem Grandma's Apron.I grew up in the Willamette Valley on a small farm. I remember very well all the uses that my grandmother and mother used their apron's for. The ladies of my church had a program about Apron's last year(2008). This year it will be about Hanky's. Enjoyed your blog. While looking for the poem "Grandma's Apron" I was directed to your blog. What a delight. I live in Silverton now but in the late "40's thru "82 I lived in Southern Californina. My husband was manager of JCPenney stores there. We had large fabric departments. As a young mother in the "50's" I made not only aprons but most of my clothes. I was privileged to sew dresses for display on the maniquins for ladies and children. The dept. mgr. selected materials and patterns and when they were finished with them they were mine. I was grateful for such an up to date wardrobe for my daughter and myself. And, yes, aprons were a staple. Wonderful memories! Thanks. I don't know if this will reach you since this blog is dated several years back. But I pray for God's richest blessing on you as you bless so many of us. When I was little my sister and I used to help my grandmother in the kitchen, and we used to love to wear her apron. Then one year I think it was at christmas, we both got our own little aprons. Mine was red with little white polkadots and a white lace trim and my sisters was red and white stripes with red trim. I remember feeling so proud to have my own apron. My grandmother gave us our apron when we move out on our own and to this day I still wear it. Even my fiance wears it now!! My grandmother still to this day wears her apron when she is cooking and I get such a sense of warm homely comfort that I wish I was five again standing on a chair helping her in the kitchen. Merci grand-maman pour ton amour et pour mon tablier. It's so lovely of you to make sure the correct version of Tina Trivett's wonderful poem stays alive. I came to your blog from a link on another website that had a much less poetic version of Grandmother's Apron posted. I love that line about holding wildflowers in the aprons. Grandmothers are so special because they can love us without having to worry about being responsible for our discipline. You wrote this a while ago, so I wonder if you ever did make a Nanny Apron. I'm going to search your blog now to see if you did, but I think that's such a great way to remember someone you loved. Thanks for the post! I love your poem. 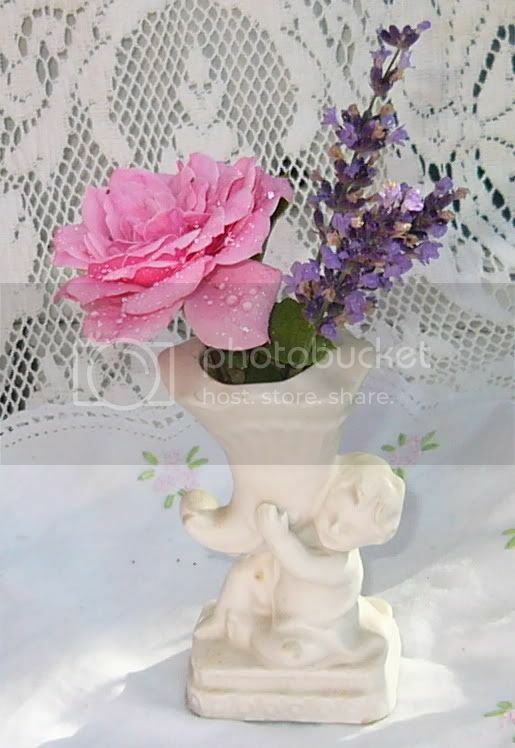 I was missing my grandmother this evening and googling various topics related to grandmothers, when I found your blog.